Here you can find information on all our puppies that compete in Agility... perhaps you've even seen them on the circuit! Indie measures as a large agility dog. She has had a superb career so far winning herself into Grade 7 and making champ finals. Summer measures as a standard agility dog. After a period of retraining she is now back competing and has made her way into Champion at UKA and also competed at the UK Agility Grand Finals in 2014, 2016 and 2017. She is Grade 3 at KC and will hopefully be moving up soon. Jazz has had a fantastic season and has won out of KC Grades 1,2,3,4 also gaining both his Bronze and Silver Agility Warrants. He has moved into Champion Steeplechase and Performance at UKA. At the UKA Grand Finals he helped his team take 3rd in the Team Event, he has qualified for the Novice Olympia Semi Finals and came 4th in the Agility Club Veterans Final. ​Anni is now retired form agility. After a short career she won into KC Grade 4 and gained her Bronze Agility Warrant and is looking very good indeed, wont be long till she is in Grade 5! She has also moved into Senior in both Steeplechase and Performance in UKA and came 3rd at the UKA Grand Finals. ​Candy has now retired from agility and in her short career won from Grade 1 into Grade 4 and gained her Bronze Agility Warrant. ​Flyte is a very easy medium for agility. She has come on a lot recently and has moved into Champion Steeplechase and Senior Performance in UKA. She has now also moved into Grade 6 at KC shows and is only needing two wins for Grade 7.She also qualified for the 2016 and 2017 UK Agility Grand Finals. ​Meg is a medium agility dog and is a damn quick one at that too! In her first season Meg has already moved into Champion steeplechase at UKA and competed in the UKA Games Challenges Finals multiple times. Zeva measures as a standard agility dog. In 2015 she came 4th at the UK Agility Grand Finals and has now since moved into Senior. Due to the new rules she is now able to compete at KC in Grade 3. She is certainly a speedy girl so will hopefully be able to move up soon, she just needs to learn to close her mouth to help her concentrate! ​Cassie has already reached Grade 7. She has qualified for Olympia 2014 and has been selected to represent team Scotland in the 2015 World Agility Open. ​Mist hasn't been competing for long however she has already won out of Grade 1. Wont be long till she is in Grade 3 either! ​Pan has only just started competing and on his first show he took 2nd place so it wont be long till he is moving through the grades!! Holly measures as a large agility dog. She has won her way into Grade 3 at KC. Casper measures as a large agility dog. He has already moved into Novice at UKA and is well on his way to Senior. He has also won his way out of Grade 1 and up into Grade 3 at KC and im sure will be moving up soon! Aero measures as a standard agility dog. He is currently enjoying his training may well head into the competition ring soon! Enzo measures as a standard agility dog. He has started competing and already won into Novice at UKA. Divo measures as a standard agility dog. He has now started to compete and is coming along great. He is a speedy boy and will make an interesting watch over the next year as he progresses. Dylan measures as a standard agility dog. He has been doing really well in training and will hopefully be competing soon. Costa measures as a Standard agility dog. He has had great few runs for competition and is loving the sport. Hes a speedy boy and we are looking forward to a full season ahead. Flick measures as a Standard agility dog. She has had an amazing start to her career and reached Grade 7 before her 3rd birthday!! She competed in her first Champs class and made it through to the final. Nip measures as a large agility dog. He had a super start to his career and won into Grade 4 by several seconds. He then followed on by winning into Grade 5 and now has his first win towards Grade 6 which he also achieved by being 5 seconds quicker than second place! He is a speedy boy and loves his agility, he can normally be found bouncing like a loon waiting to run. Ted measures as a large agility dog. He is currently progressing very well with his training and has just started to compete. He isn't at all slow and will certainly be one to watch! Woody measures as a Standard agility dog and is starting out on his first season in competitions, he has already had some wins at UKA and is looking very speedy indeed! 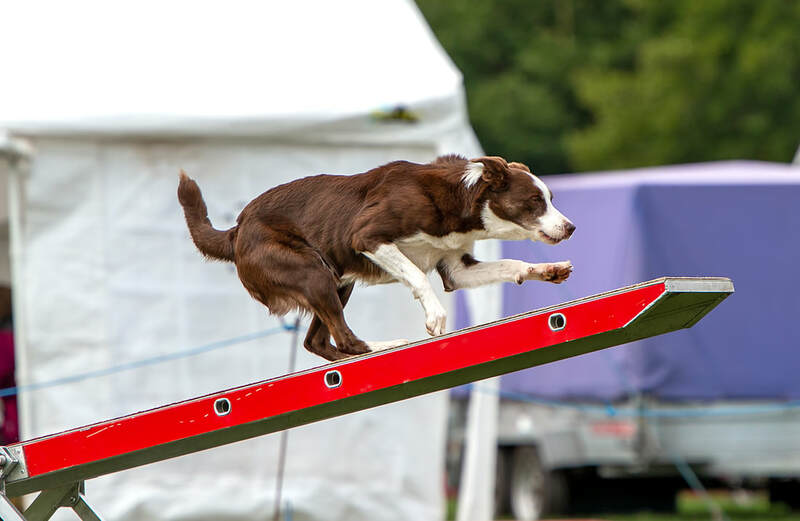 Beck measures as a Medium agility dog and in her first few months of competing she has already moved into Senior Steeplechase and Novice Performance at UKA. Beck is from our first litter of Cocker Spaniels x Border Collies. Minion measures as a Standard agility dog and is coming along nicely with his training. He made his debut at the end of 2017 and won his first class at UKA. We will be progressing with contacts in 2018 and hope to see him winning more. Diva measures as a standard agility dog. She is currently in training but coming along well and we hope to see her in the ring soon. Gracie measures as a full height dog and has just started to compete in agility where she has already won up the grades and into Grade 4. Teeze measures as a medium agility dog and is from our second litter of cocker x collies. She headed to her first KC show and has already won her first strike towards Grade 4 with a jumping win. Teak measures as a medium agility dog and is also from our second litter of cocker x collies. He is doing very well in training and we look forward to seeing his progress. Ren measures a standard agility dog and is from our second litter of cocker x collies. She is coming along well with her training and has now started to compete, we look forward to seeing her progress in 2018. Biss measures as a medium agility dog. She has just hit the rings and already gained her first two wins at Grade 3 and in UKA. She is super speedy and looks like she is going to be amazing! Logic measures as a standard agility dog. He has now started NFC runs and is looking good. He takes after his Mum and his favourite things are the contacts! Looking forward to getting some more foundation work in 2018. Flynn measures as a standard/large agility dog. He has now had his first few NFC runs and the odd run for competition where he brought home lots of rosettes already. We look forward to seeing how he progresses with more ring experience. Tullulah measures as a standard height dog and competes at Champ in UKA. She has had a few second places in KC Grade 3 but never managed that elusive win. At 12 years old she is on her last competitive season however she still qualified for the UKA Grand Finals in the CSJ Grand Prix! Ruby just measures into medium at UKA (yet to be measured for KC) however she certainly has no problem jumping so it really doesn't effect her. She is a speedy little spaniel who really enjoys her training. Hopefully she will make her competition debut later this year.